New Headway Elementary briefly revises Level A1, and then takes the student through Level A2. completed New Headway Elementary, they would be ready to sit the KET exam. New Headway Elementary is basically for students who are not absolute beginners. For example, they should already know : I am, where are you from ?, What's your job. If they don't know these basic terms then the teacher should be using New Headway Beginner. You the teacher will need the New Headway Elementary student's book, the New Headway Elementary workbook, and also the New Headway Elementary class audio. 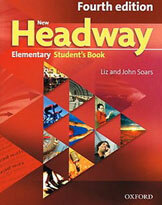 You will also learn how to play the New Headway Elementary audio when teaching English over Skype.